Sunday June 20th 1920 Hattie and Edith went to church. I walked out to Hedges. Charlie & Tishie were there alone and I staid till late in the afternoon. Such a good visit. When I got home found Hattie & Edith riding with Otts folks. Evening at home. Monday June 21sy 1920 I ironed for myself all forenoon. I sewed a little in afternoon and helped Hattie clean silver. Ott went to Kansas City. I was down there after supper. wrote Lydia. Tuesday June 22nd 1930 I could not help much about the work. The Kaspers come about nine oclock. Hattie gave a luncheon for more than 20 ladies. I ate early meal alone in my kitchen while Rob & William had their dinners and went to town with Rob. Was at Dr Smiths office and spent afternoon with Ida Anderson. Home at 5 oclock. Cora to town with Rob. Edith and Hattie down at Fannies. 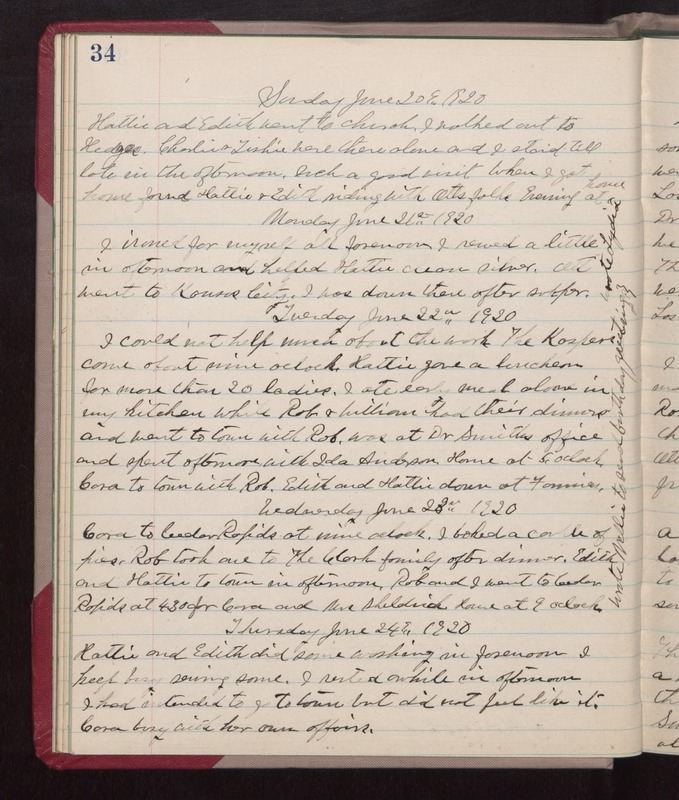 Wednesday June 23rd 1920 Cora to Cedar Rapids at nine oclock. I baked a couple of pies. Rob took one to The Clark family after dinner. Edith and Hattie to town in afternoon. Rob and I went to Cedar Rapids at 4.30 for Cora and Mrs Sheldrick. Home at 9 oclock. Wrote Mollie to send birthday greeting. Thursday June 24th 1920 Hattie and Edith did some washing in forenoon. I keep busy sewing some. I rested awhile in afternoon. I had intended to got to town but did not feel like it. Cora busy with her own affairs.